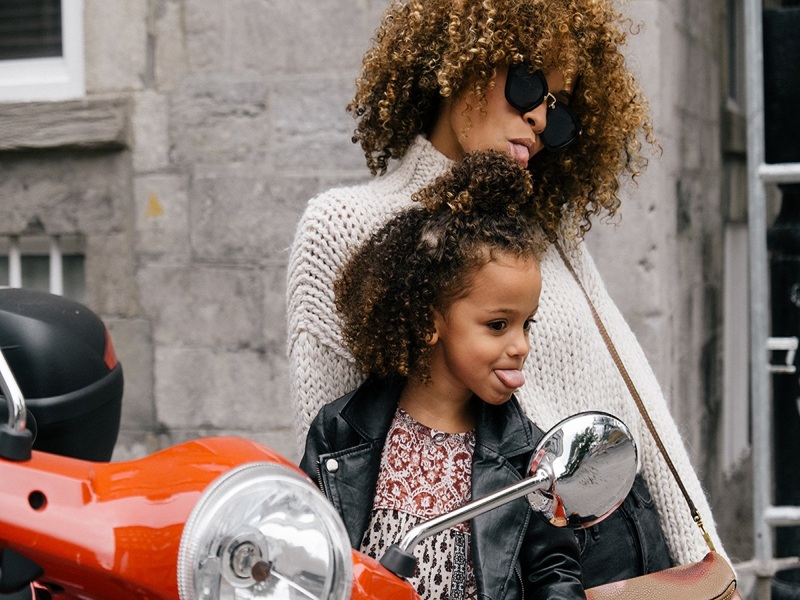 Mother’s Day is fast approaching on Sunday 31 March 2019, and we love gifts with a personal touch! We have put together a list of some of our favourites below to help. 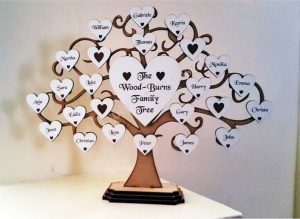 This Personalised Family Tree has 24 hearts that can be personalised with names of your family. 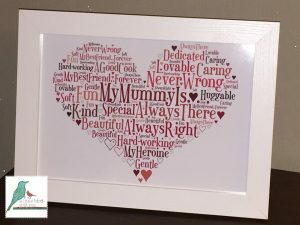 A beautiful personalised word art picture where you can add all of your own words to make it a truly unique personalised gift that will be treasured. Your print will be one of a kind – specifically made to order and to your individual specifications. 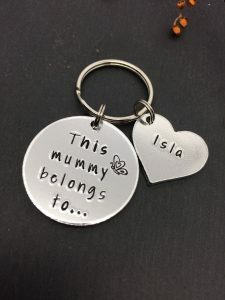 This key ring is hand stamped and is made from aluminium. Aluminium is a lightweight metal which makes it ideal for a key ring, it will not tarnish and is hypoallergenic. 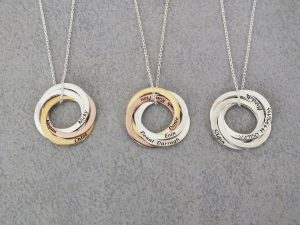 A lovely circular personalised necklace is such a thoughtful gift and you can add the names of your children on to this pretty necklace making it great for Mother’s Day. How gorgeous is this bracelet? Simply take a picture of your message and it can be turned into a beautiful piece of jewellery. Really great for helping to create special memories that will last. 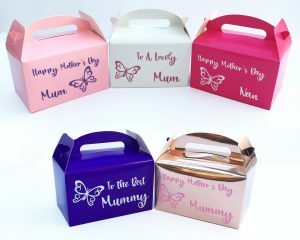 You can fill these adorable personalised Mother’s Day gift boxes with their favourite items guaranteed to put a smile on mum’s face this year. 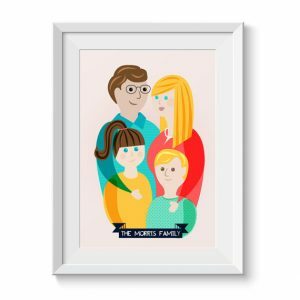 The super talented Sam Osborne creates custom family portraits in her own colourful style that make the perfect personal gift. These personalised pieces of artwork make a lovely thoughtful gift at a really good price. What mum wouldn’t like to receive these delicious looking biscuits? 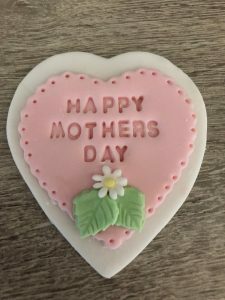 Each Biscuit is made from Homemade Shortbread and is topped with a Fondant Topper secured with Royal Icing. They will be individually placed in cellophane bags, tied with curling ribbon. We really hope you found this post useful. 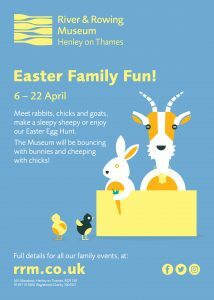 For other ideas on what’s on in Berkshire for families, click here. Fancy taking your mum out for afternoon tea in Berkshire and just beyond? We’re got some great suggestions here.